Back when I watched this movie for the first time and then mentioned on here how much I had liked it, everyone informed me it was a book also! So when news of the mini-series broke and the teasers started being released, I decided to read it. I liked it a lot! I think someone mentioned the movie was very close to the book AND OH MY GOSH IS THIS TRUE. Like seriously, I cannot imagine that people would be unhappy with the book's translation to film, because it seemed almost scene by scene. Like, really the only thing missing from the movie is some of Rosemary's internal thought processes--you might not be aware that she felt really violated by her husband the night she was raped or that she had all these sneaking suspicions about him throughout the book about his self-absorption and ambition, etc. But ultimately, I think the film was pretty successful. But GREAT BOOK. Even if I knew everything that was coming, it's such a delicious horror story. There's such a great sense of unease permeating the pages and a desperation to somehow yell at Rosemary to get herself as far away from the Bram as possible AND WHY ARE YOU TRUSTING THOSE PEOPLE and yes your husband is every bit as horrible as your darkest thought about him. Is it not brilliant that he's an actor and his name is Guy, I MEAN REALLY. I think the mini-series (starting May 11!!!) will change things though? I think they are going to actually show Guy strike his bargain and it will be for money not for his own career...whyyyyyyyyyy. But still Patrick Adams is such perfect casting, I could not be more pleased. And any chance to see Zoe Saldana is A++ after all. Anyway! 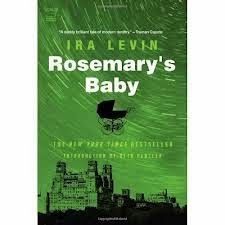 I think I'd like to read more of Ira Levin's books. Any recs? Oh I did hear I should never read Son of Rosemary so I read the synopsis and WHAT EVEN. I can't believe Levin would ruin such a great horror story in that way. In my opinion it's like the Buffy comics and not canon, sorry. So! This book is recommended a lot! I started reading it during the readathon and basically the result of the two books I read during the readathon is that I kind of want to real all the author's backlists!